C.Y. Leung’s visit to Zhuhai last week confirmed what has been apparent for months – the grand project to build a bridge across the Pearl River mouth is so far off schedule no-one can say when it will be finished. At the start of the year the 50-km bridge was slated to come into service by the end of 2016 as originally planned. In January the government took a request to LegCo for an extra $5.46 billion, and acknowledged it was waiting on a fresh analysis from the Highways Dept to give a revised timetable. Officials had no trouble in finding reasons for the spike in budget: the high number of construction projects, machinery costs, rising wages, the environmental assessment, the delay caused by the 2010 judicial review and the cost of the new immigration facilities. The bridge was scheduled to be completed next year, but Li said even 2020 was a difficult target because of technical difficulties in laying sections of tubes on the seabed and joining them to make a tunnel. On the mainland side, Zhuhai party secretary Li Jia said his part of the project would be “basically” completed next year. 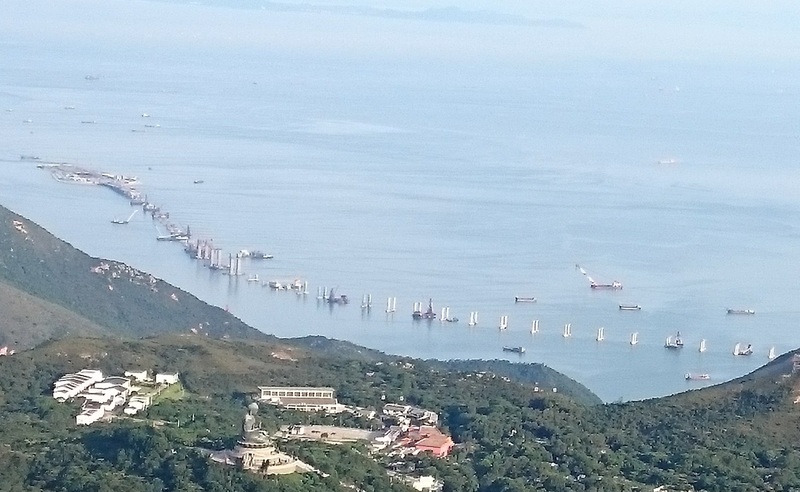 While Hong Kong is sharing the costs of the bridge with Macau and the Guangdong and national governments, it is bearing the sole burden of the other components: an artificial island off Chek Lap Kok to support the bridge landing, the topside customs and commercial facilities, a bridge-tunnel link between Chek Lap Kok and Tuen Mun and a freeway bypass around Tuen Mun. The indefinite delay and the uncertain business case for the bridge means it has already joined projects such as the Kai Tak Cruise Terminal, the West Kowloon Terminus and the Stonecutters Bridge on the list of dubious taxpayer-funded SAR undertakings. The current difficulties suggests when it comes to project length it will outlast all of them. All of which begs the question. If the project is in trouble why would a politician so publicly identify himself with it? Once again Hong Kong’s leader shows the instincts of a mainland official rather than a quasi-democratic politician. The purpose of the Zhuhai trip, his second in 18 months, seems to have been to signal to Beijing his support for the project despite its issues. The construction of major public works, from the high-speed rail network to airports and ring roads, is the stuff of modern China nation-building. The $90 billion of Hong Kong public funds is a sign of the city’s commitment to the bridge and our fealty to Beijing.